... "The continent of Lucentium lies in the warm embrace of the Southern Border Seas, far away from the coldness of winter. 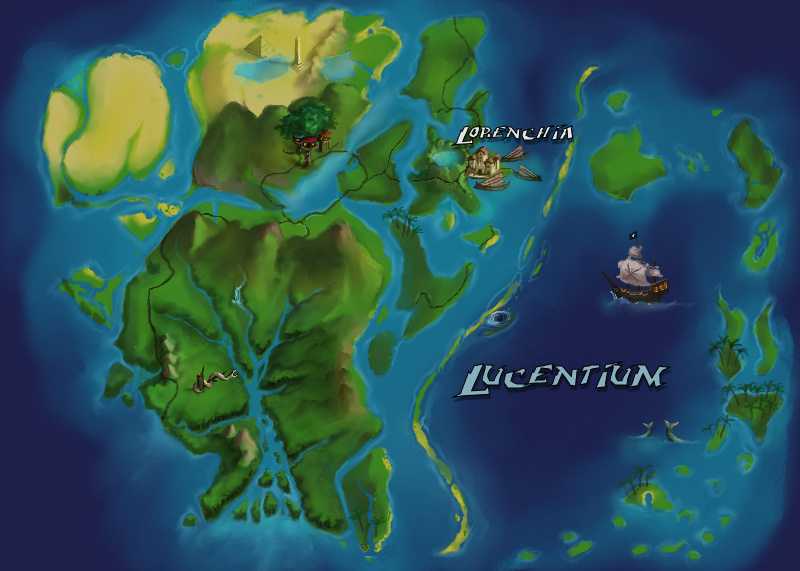 The continent derives its name from its largest island, Lucentia. The vast island is covered in deep forests that turn into evergreen rain forests at the southern regions. In the north a great mountain range, Mountains of Las, splits the island, leaving a narrow strip of land on its northern side. That is where most of the island's civilized population resides, sheltered from the outside world. From the Mountains of Las, dozens of rivers gain momentum as they run towards the south and merge to form the great River of Laesa. The few adventurers that have ever ventured along it say that at places the river is so wide that one cannot see the opposing shore! The deep forests are mostly unexplored and hide countless of secrets in their depths. Mythical beasts are said to roam there, and the number of different plants and trees is overwhelming..."
"To the north from Lucentia, there are two desolate desert islands called Caetar (that has lots of sand and nothing much more) and Tricet (where one can see a huge salt lake, and equally much sand). However, the southeast corner of Tricet is fertile, and that is whre the Felid Kingdom of the seafaring Catfolk is located..."
"East from the twin desert islands, or northeast from Lucentia, there are four major islands, where most of the continent's population live. The islands, despite their proximity, are quite different from one another; the northernmost island is called Lycaes, and it is the forest-covered home of the Centaurs..."
... "Southwest from Lycaes one can find the island of Satyre, home to the Satyrs and many of their Bards. The southest of the four islands is the hilly and scarcely populated Kath'ar." "Encircled by these three islands is located the Land of Lor. Lor is the busy centre of the seafarers, merchants and adventurers. Its multicultural capital is Lorenchia, which is ruled by the Royal family of Lor. The island also has one of the most amazing wonders of the nature - the mountain lake of See'ra, where hundreds of cascades spill their waters from the surrounding mountains, making a sheer fall of hundreds, if not thousands of feet. Because of the cascades and cataracts the lake is almost always covered in fine mist. Behind the waterfalls there are small caves and natural terraces that give a magnificent view to the lake. It is said among the Elven poets that the lake of See'ra is a place where one can find the perfect inspiration. Many artists and thinkers visit the lake, but scaling to the terraces has claimed many lives..."
"East from Lucentia, Lor and Kath'ar the lands are separated from the open sea by the mighty Reef of Lost Sails - perilous shallows that have been demise to myriads of ships; hence the name. The Reef has countless of small islands that are inhabited by odd animals and equally peculiar plants. Many leagues long stretches of fine sand line these islands ... There are no known permanent settlements at the Reef." "Far, far east there is the Archipelago of Azury, a place where few have ever ventured. Countless tales are told about it, however - tales of stunningly beautiful mermaids and nightmarish monsters of the unknown waters. The southern parts of the Archipelago consist of hundreds of volcanic islands and islets. Most of them are surrounded by sandy beaches that are lined with palm trees. Some call them Paradise Islands, but those who say so, have been there when the Sun has shined and the weather has been beautiful; when there is a tropical storm and the ocean shows its rage, the islands are as far from a paradise as a place can be." "The notorious Islands of Lost Hope are a group of three islands north from the Archipelago of Azury. Pirates, cutthroats and buccaneers use these remote lands as their hideout between their raids to the civilized islands. The Buccaneer's Cove is said to be the heart of the Lost Hope, but few who go there ever come back, so the stories are without verification..."
"North from the Lost Hope there are several scarcely populated islands. Unnamed and age-old races live there, hidden in their isolated worlds ... Some rumors tell cannibals live at some of the islands. However, the exact race of these cannibals remains unknown; some say they are Humans that devour man-flesh, others claim that there are savage Elves that eat travellers. The latter story is strongly denied by the Queen herself - cannibalism is not of Elven nature, but would suit better that of the Humans." ... "-so briefly it can be said, that there is a huge number of tribes and unknown races at Lucentium. However, here we want to concentrate mainly on the civilized peoples, with some additional words about the native peoples - mostly as a curiosity..."
"The greatest wielders of power at the region are the Felid King and the ruling family of Lor. The Catfolk and Human kingdoms have coexisted in peace for a relatively long time. The Four Islands and the surrounding waters are one of the busiest trading routes in the known world. Both kingdoms benefit greatly from the lively markets of pearl, amber, exotic wood, ivory, gold, gemstones, spices and countless of other luxuries the surrounding lands provide. These goods are exported mostly by the Mercantile Fleet of the Humans, while the seafaring Catfolk of the Felid Kingdom keep the waters safe from pirates and other hostiles - naturally requiring generous rewards in return. The main imports to the area are tools of warfare that are mostly of Human and Dwarven origin, and iron and steel that are scarcely found on Lucentium. In addition to these imports, the busy markets trade just about everything from slaves and exotic animals to magical talismans and reagents for alchemist potions." ... "As mentioned, the Catfolk Fleet is the strongest naval power of the region. The Mercantile Fleet naturally has warships of their own, as do people of Lorenchia and almost any other kingdom of Lucentium - but none of the fleets match in power with the Felid warships; a fact that might sound amusing to us northern people, who have mostly seen Catfolk that fear water..."
"...and naturally the riches of the continent attract pirates and buccaneers like nightly campfire lures moths. Albeit there have been no wars between kingdoms for decades, the pirates are now a bigger risk than they have ever been. Thus the main activities of the Felid Fleet has been hunting down the pirates. Despite of their efforts, the Fleet has been unable to rid Lucentium of this scourge. The pirates, that are of almost any race and origin, use small and quick ships, and skillfully use the cover of the islands and the treacherous waters of the Reef to hide from the Fleet - and to attack their prey; for unescorted ships are plentiful in the region as not everybody can afford to have protection. The most arrogant and best-organised pirates attack even the biggest Merchant vessels, and thus cause great grief to the peoples of the continent. Many of the pirates are said to have a hideout at the three islands of Lost Hope, but shallow and treacherous waters have prevented the Felid Fleet from reaching them. In addition to local pirates, Gnolls of the North send regularly their ships to these waters, robbing valuables and capturing thralls, who then have to row in their galleons and are later eaten." ... "So one can conclude this by saying that Lucentium is a relatively peaceful world, but the threat of the pirates and Gnoll marauders has increased alarmingly. Furthermore, one should not forget the hostile nature of many of the feral tribes and mystical races that inhabit some of the smaller islands - such as the Merfolk who are said to inhabit the Archipelago of Azury and the picturesque islands there, which have palm trees and white sand (see more in Chapter III). Finally, the main island itself has vast, unexplored forests where exotic beasts roam. Many have journeyed there, but not all of them have returned." "The tropical islands that form Archipelago of Azury are said to be of volcanic origin. In addition, stories tell that some of the islands are made of coral, and that the islands form peculiar shapes that are sometimes called as 'atolls' and 'lagoons' depending on their shape and suspected origin. There are few facts to tell about the islands, as only the bravest and most skilled mariners have ever sailed their ships that far. The coral reefs are said to have thousands of colourful fish and other sea creatures that have never been recorded anywhere else. There are also tales of terrible sea monsters that resemble mythical dragons, and equally horrible squid-like creatures that can crush ships and eat their crew. Furthermore, ship-sized sharks are said to live there (although one tale tells that they are actually peaceful and do not threaten ships or mariners - a tale that is indeed hard to believe). Other, better-documented cases tell about giant marine turtles that have lost their legs and never enter dry land. Huge Black Rays have been seen. Some scholars claim they are actually fish, but their shape is odd and sinister nonetheless, and more popular belief is that they are creatures of Evil and lure ships on shallows, where they get wrecked and the Black Rays eat the sailors..."
"...However, despite all these perils, the Azury islands themselves are described as 'Paradise Islands', where warm Sun shines and pleasant winds blow all round the year. There have been records of horrible storms that can destroy whole islands, though, so the name must be regarded as misguiding. Perhaps the main reason why these islands are increasingly interesting to civilized people is pearl. The shallow waters around the islands and reefs are said to have the biggest and purest of all pearls, and they are more abundant there than anywhere else in the known world. Furthermore, it is said that the extremely rare black pearl is also found on these waters. Unfortunately, an exotic people of Merfolk live in these waters, and they guard their treasures, often jealously and with hostility. The Merfolk only sell the pearls with great price, and therefore many Merchants hope they could get rid of this people so they could harvest the pearls more efficiently ... In addition to pearls, many corals and exotic fish and other animals are regarded as very valuable goods, and they are somewhat easier to acquire without angering the Merfolk ... However, there are few cases where the Mercantile Fleet have lost their ships and the cause was not either the Merfolk nor perilous reefs - but instead warriors of some marine people that has no name, but are said to look like humanoid lobsters or crabs. Whether these tales are true, remains unclear." "...and so, there we were, slowly sailing northwards along the mighty River of Laesa. We had a guide, a red-skinned person who possibly was a wild elf [this piece of information must be regarded as highly dubious at very least -editor's note]. We sailed along with a raft built of tree-tall grass that the local savages call 'bamboe'. We encountered blood-sucking gnats that were the size of a man's fist! However, what I was after for was an almost-mythical serpentine beast called Anaconda. The Anaconda of Lucentium are rumoured to be the largest snakes in the world, some growing as long as one hundred and fifty feet! I have a friend of mine that is a zoologist and well-renowned scholar, and he paid me well to get him a Lucentium Anaconda snake." ... "We saw stunningly beautiful Mermaids who wore only seashells and colourful seaweeds. However, the People of the Sea turned out to be very suspicious towards Human mariners, and only our Goblin scout, Axxon, was allowed to visit the Inner Islands. I can tell you some of the crew were envious and unhappy! Axxon the Goblin paid few visits to the Islands, where the Merfolk had some trading outposts that were not undersea. The Goblin managed to trade some of our goods to pearls and odd seashells, but surprisingly the Merfolk seemed to be more interested in our ship cats than any goods we brought. So Axxon traded half a dozen or so kittens that we had onboard (one of our cats had had a litter during the journey - lucky for us!). In return the Goblin received ten black pearls - each one worth more than five war horses! As I thought about it I was happy we sent the Goblin: probably anyone else of my crew would have tried to steal the pearls, but Axxon is one of the most honest and trustworthy companions I have had on my voyages." "...and after all the trading was done, we left the same way we came: along the Reef of Lost Sails and to the land of Kath'ar near Lorenchia. I am not sure if we will ever return; even though we could bring them hundreds of kittens, the overall cost of the journey including all its perils just makes it not worth the effort. But if someone ever sees cats at Azury, let them know that the cats are as far from as Shadowkeep!" "I have reached the terrace now. The journey was more difficult and more time-consuming I ever believed - even though I was warned many a time. Merely the trip from Lorenchia to the Lake See'ra took me a very long time, for the roads were few and far between. I bought a small scull from a local woodsman, and rowed upstream the River Seer. There were cascades on the way, so I had to carry it some way. After I reached the misty Lake, I idly drifted along, marvelling its beauty. By nightfall I had spotted this place, and during the last moments of daylight I managed to scale up here and make the camp." "Nonetheless, it now seems coming here was well worth the effort! This places is an odd mixture of untamed wilderness (in form of the hundred waterfalls) and serene beauty (the placid lake that is covered by mist). As I write this now, it is my second day on the mountains, at the terrace behind a waterfall. There is a cliff next to me, where I can go and have a view over the lake that spreads far below. The Sun is setting, casting amber and purple shades to the mist; this is so much different from any sunset I have seen in my life! The place is special on many other ways, too; Above me, on the steep mountain side, there are plants growing on the bare rock, their roots hanging in the midair - I suspect they gather moisture from the air itself! Animals I have seen only few: colourful frogs that live on the mountain side, small birds that hover in the air like dragonflies, sparkling and shimmering - to me they look like small jewels. And then there are dragonflies, huge ones that seem to hunt these small, shining birds. Where I come from, far in the north, it is the other way round..."
"The Seacats, our elite mariners, successfully dispatched a pirate fleet. We lost only few soldiers, but we had Lady Luck on our side this time: before engagement the winds suddenly shifted and drove two of their biggest Frigates against sharp rocks that line the Reef east from Lor. Had the winds turned to another direction, it might have been our mew-of-war that would have hit the rocks. We boarded the remaining pirate Sloops, and after a brief but fierce melee we captured them. The Felid Navy knows no mercy towards pirates, so we disembowelled the crew and tied the pirate captain - a tall Ogre outlaw - to the mast. He screamed for mercy for three days, but finally he died and the seagulls ate his eyes. A fate of a pirate. However, this big pirate fleet makes me worried; their power is increasing all the time, and their arrogance knows no limits. Hundreds have died at the hands of the pirates already this year - the riches of the Trade Company and the Mercantile Fleet seem make them spawn like rats. Decisive action is needed!"